What is Jeremy Corbyn’s Plan for Inheritance Tax? 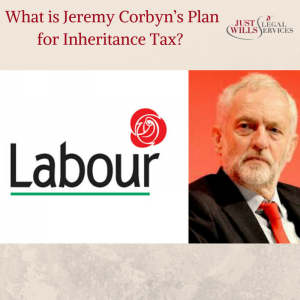 With the UK General Election looming we take a look at Jeremy Corbyn’s planned changes to the seemingly ever-changing Inheritance Tax. Currently, married couples or civil partners can pass on an estate of value up to £850,000 to their direct descendants without having to pay IHT. This is inclusive of the new laws of the additional Residence Nil Rate Band (RNRB) that came into play on April 6th 2017. It has emerged that labour plan to slash this “death duty” threshold to £425,000. That is the total value of the combined estate between two spouses, not an individual. As before, any value of the estate over this threshold is to be taxed at 40%. The controversy surrounding this change is that the average market price of a home in the UK is £300,000. This means that an incredibly large number of couples will have other assets that value over £125,000, carrying them over the “death duty” threshold and thus making them liable to owe an excruciating amount of IHT. The impact is even greater if you live in the capital. The average home in London will cost you £600,000, which is already £175,000 over the threshold (you already owe £175,000 x 0.4 = £70,000!) before you even consider any other asset contributing to your estate. This change would undo the hard-fought gains won by a Daily Express crusade who initially tried to get the controversial tax abolished, but settled when the Tories raised the threshold to £850,000. This is in conjunction to the overall objective of reversing some of the Tories’ recent “tax giveaways”, Shadow Chancellor John McDonnell told the BBC on Wednesday 3rd May 2017. Labour defends the decision by pointing out that, according to the Tories’ figures, a cost of £1billion would be incurred as only 26,000 fewer estates would have no tax liability by 2020-2021. Labour are thus speculated to use IHT as a source of government funding for Corbyn’s proposed expenditure scheme that will supposedly be pumped into abolishing university tuition fees, improving infrastructure and reviving nurses’ bursaries – something that Theresa May has come under harsh criticism for in recent weeks. What needs to be pointed out is the dispersal of income under this mechanism. Is it likely that the IHT revenue extracted from Londoners (those who are statistically most likely to pay more) will be used to, say, improve infrastructure in London and thus improve income there? Labour, and political parties throughout history, often shy away from this question as the answer will upset at least some of the voting population. What are your views of Labours plans for Inheritance Tax? Let us know.